Operating since the mid-nineties under a variety of monikers and collaborations, German musician and label owner Bernd Friedmann has built up a totally unique catalogue. He has taken his ethic and vision into his label, Nonplace, which he founded ten years ago. 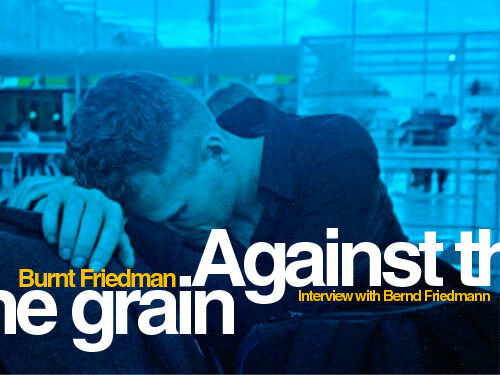 To celebrate this first decade, Friedmann collected a bunch of previously unheard versions and mixes of tracks that have appeared on various albums over the years. We took the opportunity of this landmark anniversary to speak to the man about the last ten years of releases and talk about his many projects, including his much celebrated collaboration with form Can drummer Jaki Liebezeit. Bernd, happy anniversary. It’s ten years since you set up Nonplace, which is no mean achievement, especially nowadays. Looking back, what are your thoughts on that time? To point at a label’s anniversary is a contradictory idea, as I am always concerned with the music that is coming rather than with the projects accomplished; but there were a few persistent homeless tracks that couldn’t be part of any previous collections; these pieces triggered the idea. It occurred to me later that I had closed a chapter with this Anniversary edition. Recordings – poops and yearns brought to tape – can function like a diary; when trying to remember a certain period of my life I recall the music that I was involved with, especially by looking upon tapes and track titles. Remarkable tracks initially manage to record and forever memorize personal dispositions. Everyone probably knows about the feelings attached to musical pieces, feelings that somehow engrave into the groove when first played back. From today’s point of view, it seems like the Coca Cola elements in my blood circuit have been flushed out. It may sound like an esoteric health experience but why not? Maybe not yet clearly audible, I abandon what has become known as pop, jazz, roots, etc. What made you decide to set up the label in the first place? From a theoretical point of view, imagining I was a painter but the artworks were owned by the gallery is an odd concept to me. To some extend, it is a comparable set up, only that the market value of products is drastically greater. Practically-speaking, in 1999 my label partner and Nonplace co-founder Oke Göttlich offered his support to help with administration and communication. We were encouraged to set up this company because our own talents could develop further independently. Until then, it felt like my musical catalogue was scattered amongst an unfortunate mess of international label releases (Nonplace Urban Field, Drome and Flanger on Ninja Tune, Kiff sm, DOT, Leaf, Incoming, ~Scape). Some of the labels ceased to exist while preparing my release from 1997-1999. Thus I gathered three different album projects which sat on my shelf. Did you have a very clear idea of the type of music you wanted to release back then, and has it changed in any way over the years? My initial approach as a dilettante could have been described as the appropriation of genre clichés to ridicule their content, overcome preconceptions and hopefully create something new. For instance, with Just Landed (B.F. & The Nu Dub Players) and the 1997 Templates album by Flanger, it was Atom’s and my purpose to spoil ‘instrumental jazz’ with what is known as ‘programmed electronic music’. With Con Ritmo, a year later, I pointed to the paradox that the more natural a sound may appear on record, the more artificial its processing, and the more expensive the tools to achieve this. I wouldn’t prefer the authentic over the fake! I still hope a discourse would rather describe audible musical forms or invent a unique vocabulary, instead of perpetuating, confusing terms like electronica, codes that direct people into dead end streets. Terms like these make music styles feel artificial, marginalising the most vital initial elements within global music, as they are more difficult to grasp. Regardless of the actual musical direction, I wanted Nonplace to be fighting this process of redundancy in a field that is clearly wide open. In the beginning of Nonplace, in 2000 I was predominantly locked in front of my Atari MIDI sequencer, trying to simulate, and mess with, traditional South American rhythms by solely using a sampler. I was happy to see that change by working with Jaki Liebezeit and Hayden Chisholm and international artists from 2002 until today. Guitar sound-artist Joseph Suchy was the first one who joined the studio sessions with his contributions on Con Ritmo and you can hear him on almost all Nonplace releases from then until now. With an understanding of sequencing and production I think both parties did benefit from the marriage of live improvisation and studio composing. To celebrate this tenth anniversary, you released a compilation of exclusive instrumental tracks, either remixes or versions of existing tracks released over the years. Why did you decide to release these unheard versions, and how did you choose between all the material that you had available? To me it is a fairly cinematic ‘Best Of’ Nonplace, but most of the pieces, although derived from the catalogue’s rough material, were produced for that purpose. Mark Ernestus’s mix of Makena was one of the favourites from The Embassadors’ Coptic Dub sessions, but it didn’t fit into the mood of the album. Other pieces, like Peninsula, is like one of the label’s top hits, and it should not be missed, as I wanted to give an overview across the whole spectrum, but excluding vocal contributions. Rashad Becker has been the mastering engineer for all Nonplace Records releases, but on 10th Anniversary Edition, he is featured as remixer and is involved as a composer in three of the tracks. You have released quite a lot of your own music on Nonplace, as well as quite a few collaborations. Is it a way for you to have complete control over your work? It may sound crazy, but control was absolutely needed. When looking upon fan-based discography websites I discovered more than ten releases, mostly compilations, including tracks of mine that I had not heard of. It is impossible to sort those transactions out in retrospect. Besides, it has become increasingly difficult to manage a great number of label deals, especially with digital sales added, unless there was a scenario where the labels provide a lawyer, or at least a book keeper, to represent me. Of course, now that I run a small company, administration is painful, but I can run it on my own terms, or share complicated tasks with close friends. Without the help of bass player Daniel Schroeter and his managing skills I would not be able to keep up with the company’s duties. How do you share your time between your role as head of Nonplace and your work as a musician? Understanding developments in new media, software and technology relates to both being creative and running a label. The crucial part is to prevent the Internet and evolving technologies yanking the chains, while also cultivating it, regardless of one’s activities, creative or administrative. Early CD releases often contained booklets which had little cartoons in them. What was the idea behind these? The idea of the cartoons was to convey some ideas and feelings to the listener. As one may have noticed, the main protagonist was myself, with shaved head, talking about artistic purposes in a hoity-toity style. There’s also a very ‘street’ approach to the artwork, with often loads of collages or graffiti-style visuals, which have over the years created a certain Nonplace aesthetic. Is it something that you consider an important part of the label, and how do you think this will evolve with digital downloads becoming so much more prominent? The ‘street’ approach is solely practical. With handwritten track lists and notes I avoid the computer throughout the sketch phase and have an immediate idea about the sleeve optics. By combining real surfaces on paper, like drawings or photos of such I avoid computer processing. Ever since the CDs and tapes were established we have to cope with subversive copy techniques. Regarding the loss of such a physical representation I can only look upon my own digital collection: half of it is burned on CDR, half of it squeezed into a catalogue. Packaging demolished, considered redundant, most CDRs almost seem to live longer than regular CDs. The handling of vinyl clearly goes against it. Talking of digital format, the music market has changed drastically in the last ten years. How do you manage to keep the label going through what has been a tough time for most labels? We have to accept the fact that music does not belong to a physical medium anymore, but to the ether and real time. To sound naturally reproduced, the use of electronic tools which sounds are from the start perceived only through the vibration of a loudspeaker membrane is unavoidable. Technology is its closest field. Such technologically-driven music is doomed to transform, or die with new rationalized tech standards. Now, with the absence of profit, the good thing is, some may invest into other musical territories and people may discover special, globally relevant sounds and rhythms instead. Going back to the records that have come out on Nonplace, is there one in particular that you are particularly proud of? No. Secret Rhythms 1 did affect the label in a positive way; it felt like music that I hadn’t heard before. You have released quite a few records with Flanger, the band you and Uwe Schmidt formed over ten years ago, but it’s been a little while since the last one, Spirituals, which was released five years ago. Are you planning to work together again in the future? We have started working on something new. Perhaps one of your most high profile and successful collaborations is the one with Jaki Liebezeit. How did it all start and how did the idea of the Secret Rhythms series of albums come about? In 1996 I started using pre-recorded sounds and sequences on minidisc players, as a response to DJ turntable beat-mixing. I entitled it Mix Your Own, as it contained home made sequences. On stage, I played back ten separate tracks (left and right is recorded separately), often at once. Minidisc players do not allow synchronization. In order to keep the timing I produced sequences with one determined tempo and pressed play whenever I felt was right. As a side effect the cue-points of the sequences varied, and I realized that this was a benefit, at once similar to a canon or the effects of an unusual, odd time signature. Non-western beats fascinate me. I had occasionally composed tracks in six or nine, almost by chance, or inspired by Zappa tunes. It was the time to explore further and establish a real live formation. Who could have been a better partner to investigate in odd meter grooves than Jaki Liebezeit? We listened to the sequences I used to play out live and it didn’t take long until we were preparing for the first Cologne live gig with his drums amped and freshly composed sequenced patterns ran on minidisc players. Jaki was sometimes joking about ‘secret’ rhythms, because in fact, the rhythms are obvious, not hidden! They are simply seldom heard in our country, inexistent in clubs. Each of these rhythms acquires a muscular understanding; they can’t be appropriated by intellect. The only way to feel each stroke right is to practice frequently according to the rule of the rhythm. As a consequence, in order to improve, we continue to play together. How did you work on these albums? Did you spend time together in the studio, or was it a much looser recording process, with each of you recording on your side and bringing it together at a later stage? In the beginning we focused on live performance; some of the rhythms we played only once or twice. Some grooves come from Jaki, some from myself. Only a few of these rhythms survived over the years, and if they did, they survived as a core structure for various ongoing transmutations, on each of the three albums and all live shows. Occasionally we meet up for recording sessions, but this is only to tape Jaki’s drums proper; whereas I constantly overdub, record and remix the tracks anyway, whenever possible. It is especially radical when Jaki’s drums are added to my set of patterns. You’re also playing a string of dates together throughout this year, unfortunately none in the UK. What can people expect when going to see you guys perform? It is not so much concert music as, maybe, a ritual event; ritual in the sense that the music becomes increasingly hypnotic when it plays us. Some people respond to it as a new form of club music and people are mostly baffled by the accuracy between the sequenced and the played. In general, our approach is to constitute a groove-driven musical organism. No particular instruments shall be featured in particular. Playing together means, listening carefully to what is going on. As a result, it doesn’t matter if two or two hundred instruments play together, as long as they are in tune with each other. Hence, it is not a virtuous presentation of two stern Germans, but could also be a model for denationalized global music. Jazz and dub are predominant influences in your work. How did you come to listening to these, and what musicians have been particularly influential for you? Let’s give up terms like jazz and dub. They are mistaking methods for styles; the ball is out of bounds, no candid musician would want to be accommodated by such terms. In the end, considering a truly outstanding piece, we would name the creators. There was a period of time when I was attracted to Scientist’s dub-wise versions for instance, but as so often the case, it’s becoming redundant without looking deeper and I realize that musical treasures are tucked away. Listening to such buried non-western treasures from the sixties to the eighties is what influences me most. Is that where you get your taste for improvisation? From when I started recording music in 1978, I have always ‘improvised’. That means, whenever the recording was engaged or the concert started, we forced ourselves to get the first take right, since nothing could be edited anymore. Ethnic music has been an influence early on and I believe it was a major influence to the English industrial scene, too – for being a force beyond questions of taste. During the eighties I evolved from a musician into a producer, into someone who would work with what is expressed by the piece as a sculpture and whose instrument is the mixing desk, or the signal routing system. A producer only really comes into his own at the mixing desk, the place where all sounds converge. When I started programming – in other words, when I started using samplers, keyboards and computers – then the desk did become the sole musical source in the sense that it was the only place where improvisation was possible. All the other studio equipment required logistical and administrative efforts, but the desk was the place for immediate, spontaneous action. This is where dub came into play. On First Night Forever, which you released in 2007, you worked with a number of vocalists, which was something fairly new in your work it seemed. What made you decide to record a whole album with singers, and how did the project come up? Is it something you’re willing to take further? One of the singers, Theo Altenberg, encouraged me to revive a bunch of unused instrumental tracks which I loosely worked upon over a very long period of time. After a few spontaneous vocal sessions we were both inspired to produce a whole album together. Healer contains a first-take vocal recording – no lyrics existed. During the process more and more singers got involved and the range of tracks expanded. I approached Steve Spacek, Enik, Daniel Dodd-Ellis and Barbara Panther without any particular sound or style in mind. I was simply keen to explore the effects of songs with odd time signatures. With the vocals recorded, I went through another process of rearranging the tracks, according to the vocals. Far from having a plan, I tried to realize every idea that sprang to mind. First Night Forever is also the last solo record you’ve released. Is there a follow up in the pipeline? Do you have a clear idea of what you want your next record to sound like? Sound actually is not an important factor. When drawing a sketch for instance the first dashes are essential. Their colour is secondary. Or to put it this way, when the composition is right, the colours are interchangeable. Composing is a continuous process, not accomplished by the act of recording an album. Some tracks, rhythm or whatever you call it, live forever, perpetuate into other versions, or they unveil their full potential years later. Once a year maybe another auspicious piece comes along. Are there musicians with whom you have yet had a chance to work with but would love to? How do you see Nonplace evolve in the next ten years? Are you keen on getting more artists on the label, or are you happy with the roster as it is at the moment? I am currently talking to The Drums Off Chaos group, which has five drummers, including Jaki Liebezeit and our sound engineer and drummer Maf Retter, in order to release a solo drum record with them. On the other hand, the digital download catalogue is developing independently; I might have a few reissues coming there, as well as the Flanger soundtrack for the Hungarian movie Bibliotheque Pascal in 2010, which features a few tracks from the Spirituals album, as well as new versions of other old Flanger pieces. The vinyl medium also seems to be developing further in its own direction and as I intend to release music on each format according to their inherent market rules, the catalogue will vary according to the format. If you had to choose five records, films, books or works of art, or any combination of, which ones would they be, and why? Have mercy! I would always choose the ones that I haven’t read, heard or seen. Impossible to give a straight answer. Amongst the musical pieces is the Passacaglia For Orchester, Opus no.1 from 1908 by Anton Webern. The film Shadows Of Forgotten Ancestors, often translated to Wild Horses Of Fire, by Sergei Parajanow is part of the selection though. 1. Bernd, happy anniversary. It’s ten years since you set up Nonplace, which is no mean achievement, especially nowadays. Looking back, what are your thoughts on that time? 2. What made you decide to set up the label in the first place? From a theoretical point of view, imagining I was a painter but the artworks were owned by the gallery is an odd concept to me. To some extend, it is a comparable set up, only that the market value of products is drastically greater. Practically-speaking, in 1999 my label partner and Nonplace co-founder Oke Göttlich offered his support to help with administration and communication. We were encouraged to set up this company because our own talents could develop further independently. Until then, it felt like my musical catalogue was scattered amongst an unfortunate mess of international label releases (Nonplace Urban Field, Drome and Flanger on Ninja Tune, Kiff sm, DOT, Leaf, Incoming, Scape). Some of the labels ceased to exist while preparing my release from 1997-1999. Thus I gathered three different album projects which sat on my shelf. 3. Did you have a very clear idea of the type of music you wanted to release back then, and has it changed in any way over the years? My initial approach as a dilettante could have been described as the appropriation of genre clichés to ridicule their content, overcome preconceptions and hopefully create something new. For instance, with Just Landed (B.F. & The Nu Dub Players) and the Templates album by Flanger 1997, it was Atom’s and my purpose to spoil ‘instrumental jazz’ with what is known as ‘programmed electronic music’. With Con Ritmo, a year later, I pointed to the paradox that the more natural a sound may appear on record, the more artificial its processing, and the more expensive the tools to achieve this. I wouldn’t prefer the authentic over the fake! I still hope a discourse would rather describe audible musical forms or invent a unique vocabulary, instead of perpetuating, confusing terms like electronica, codes that direct people into dead end streets. Terms like these make music styles feel artificial, marginalising the most vital initial elements within global music, as they are more difficult to grasp. 4. To celebrate this tenth anniversary, you released a compilation of exclusive instrumental tracks, either remixes or versions of existing tracks released over the years. Why did you decide to release these unheard versions, and how did you choose between all the material that you had available? 5. You have released quite a lot of your own music on Nonplace, as well as quite a few collaborations. Is it a way for you to have complete control over your work? 6. How do you share your time between your role as head of Nonplace and your work as a musician? 7. Early CD releases often contained booklets which had little cartoons in them. What was the idea behind these? 8. There’s also a very ‘street’ approach to the artwork, with often loads of collages or graffiti-style visuals, which have over the years created a certain Nonplace aesthetic. Is it something that you consider an important part of the label, and how do you think this will evolve with digital downloads becoming so much more prominent? 9. Talking of digital format, the music market has changed drastically in the last ten years. How do you manage to keep the label going through what has been a tough time for most labels? 10. Going back to the records that have come out on Nonplace, is there one in particular that you are particularly proud of? 11. You have released quite a few records with Flanger, the band you and Uwe Schmidt formed over ten years ago, but it’s been a little while since the last one, Spirituals, which was released five years ago. Are you planning to work together again in the future? 12. Perhaps one of your most high profile and successful collaborations is the one with Jaki Liebezeit. How did it all start and how did the idea of the Secret Rhythms series of albums come about? In 1996 I started using pre-recorded sounds and sequences on minidisc players, as a response to DJ turntable beat-mixing. I entitled it “Mix Your Own”, as it contained home made sequences. On stage, I played back ten separate tracks (left and right is recorded separately), often at once. Minidisc players do not allow synchronization. In order to keep the timing I produced sequences with one determined tempo and pressed play whenever I felt was right. As a side effect the cue-points of the sequences varied, and I realized that this was a benefit, at once similar to a canon or the effects of an unusual, odd time signature. Non-western beats fascinate me. I had occasionally composed tracks in six or nine, almost by chance, or inspired by Zappa tunes. 13. How did you work on these albums? Did you spend time together in the studio, or was it a much looser recording process, with each of you recording on your side and bringing it together at a later stage? 14. You’re also playing a string of dates together throughout this year, unfortunately none in the UK. What can people expect when going to see you guys perform? 15. Jazz and dub are predominant influences in your work. How did you come to listening to these, and what musicians have been particularly influential for you? Let’s give up terms like jazz and dub. They are mistaking methods for styles; the ball is out of bounds, no candid musician would want to be accommodated by such terms. Eros’ force results in fusing. In the end, considering a truly outstanding piece, we would name the creators. There was a period of time when I was attracted to Scientists dub-wise versions for instance, but as so often the case, it’s becoming redundant without looking deeper and I realize that musical treasures are tucked away. Listening to such buried non-western treasures from the sixties to the eighties is what influences me most. 16. Is that where you get your taste for improvisation ? 17. On First Night Forever, which you released in 2007, you worked with a number of vocalists, which was something fairly new in your work it seemed. What made you decide to record a whole album with singers, and how did the project come up? Is it something you’re willing to take further? 18. First Night Forever is also the last solo record you’ve released. Is there a follow up in the pipeline? Do you have a clear idea of what you want your next record to sound like? 19. Are there musicians with whom you have yet had a chance to work with but would love to? 20. How do you see Nonplace evolve in the next ten years? Are you keen on getting more artists on the label, or are you happy with the roster as it is at the moment?